Our SWRA Thanksgiving service helps ensure that Thanksgiving is truly a welcoming day for young and old alike who live on the rural and remote reservations of the Southwest. In the spirit of the holiday, Program Partners and volunteers take on the responsibility for preparing turkey and trimmings for Elders and their families at community centers in Native American communities. Most of the time, these families would struggle to celebrate Thanksgiving without the help of SWRA. Local volunteers have the opportunity to serve their community members and make a deeper connection to the Elders in their community. We have seen time and again how these connections can spark lasting relationships and unity. 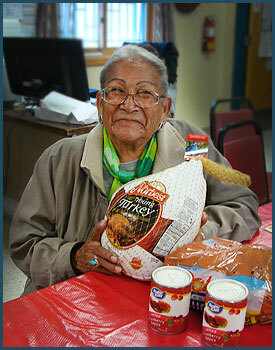 Through the SWRA Thanksgiving service, generous donors, dedicated Program Partners and their volunteers help ensure a delicious turkey dinner with the trimmings for Native Americans living in distant and rural communities across Arizona, California, New Mexico and Utah. And that’s something to be thankful for!